Looking for something special? Fancy a chat? Call us now on 01384 423 330! 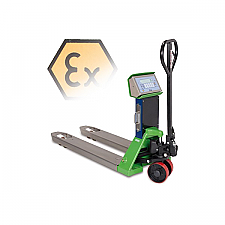 At Handling Equipment Online.com we offer a series of ATEX rated pallet trucks. Pallet trucks, otherwise known as pump trucks, pallet jacks or sack barrows, are the definitive piece of handling equipment for use with various pallets, such as CHEP or Euro pallets. Lift and movement of the pallet is provided by the combination of a fork set, which slides under the pallet, and a set of wheels or rollers providing movement and mobility for the truck. The pallet trucks adaptability is second to none, and is the last word in pallet movement. ATEX certified products are designed for use in potentially explosive atmospheres which can be caused by flammable gases, mists, vapours or by combustible dusts, and provide safe machinery able to function in such environments without risk of causing combustion. The range of ATEX pallet trucks available at Handling Equipment Online.com consists of three models of pallet trucks. The first of these, the Dini Argeo Hazardous zone 1 Atex weight scale pallet truck, available in 8 different models, the series provides load movement to a capacity of either 2000Kg or 2500Kg dependant on model. Equipped with a weight scale which is accurate to +/- 0.05% of the maximum weight capacity, providing accurate and efficient weighing of loads. All models in the range have fork dimensions of 1150x550x85mm. For more information on our range of weigh scale pallet trucks please do not hesitate to contact our technical team on 01384 895859 who will be more than happy to help you, alternatively visit the appropriate sub-category at http://www.handlingequipmentonline.com/Weigh-Scale-Pallet-Trucks/. Another model available in the ATEX range is the Dini Argeo stainless steel Hazardous zone 1 Atex weight scale pallet truck, available in two different models. Providing a maximum weight capacity of 2000Kg, and includes a weight scale accurate to +/- 0.1% of the maximum weight capacity, with fork measurements of 1182x550x80mm. On this model the bearing structure is constructed completely of stainless steel, providing a durable finish, which will not tarnish or rust regardless of the environment the truck is used in. The final model available in our ATEX series is the Dini Argeo Hazardous zone 2 Atex weight scale pallet truck. This model conforms to the ATEX hazardous zone 2 requirements, and is available 4 models. This series providing pallet movement to a weight capacity of 2000Kg, and includes a weight scale accurate to +/- 0.1% of the maximum weight capacity, with fork measurements of 1150x550x85mm. For more information on ATEX specifications and environments please visit the health and safety executive website at: http://www.hse.gov.uk/fireandexplosion/atex.htm. If you have any queries relating to our ATEX rated range, or any of our handling equipment, please do not hesitate to contact our technical team on:01384 895859, who have years of industry knowledge and experience behind them and will be more than happy to help you. © 2011 - 2019 Handling Equipment Online Ltd. All rights reserved.